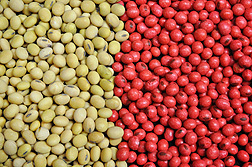 Uncoated soybean seeds (left) and polymer-coated seeds (right). The ultra-thin coating protects seeds from damage caused by the cold, wet soils of early spring. Farmers in the northern Corn Belt have a narrow springtime window to plant their crops—an interlude when the snow is gone, the soil has thawed, and the fields are not too wet and not too dry. But farmers live in an imperfect world, and planting delays can seriously reduce yields. So Agricultural Research Service plant physiologist Russ Gesch and his colleagues have conducted several studies to see whether adding a protective coating to corn and soybean seeds could help optimize planting schedules. 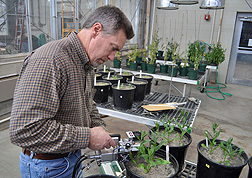 Plant physiologist Russ Gesch works with young crop plants in the lab. Gesch’s research on protective seed coatings is helping North Central Plains farmers optimize planting schedules and improve crop production. Gesch’s research began with a 3-year study he conducted with agricultural economist David Archer, who works at the ARS Northern Great Plains Research Laboratory in Mandan, North Dakota. The two researchers compared the performance of coated and uncoated corn seeds planted in early spring—when soil temperatures were still below the optimum 50°F needed for germination—and coated and uncoated seeds planted 4 to 6 weeks later. The coated seeds were covered with a temperature-activated polymer that prevented water from reaching the seeds until soils were warm enough for germination and emergence. The scientists observed that coated seeds planted in early spring had significantly greater levels of emergence and establishment than uncoated seeds planted at the same time. And the rate of emergence—how long it took 50 percent of the seeds to emerge and be established—was faster for coated seeds than for uncoated seeds. Coated seeds planted in early spring generally had similar or greater rates of emergence than uncoated seeds planted in late spring. However, coated seeds planted in late spring generally had slower emergence rates than uncoated seeds planted at the same time. To the scientists, these findings strongly indicate that farmers could use coated seeds to get a jump-start on their spring planting, because the seeds would be protected from cold, wet soils until conditions favored germination and emergence. But the soil conditions that help or hinder planting schedules aren’t just linked to seasonal changes. Farmers use no-till management to help protect soil moisture, mitigate soil erosion, and preserve soil structure. However, in late winter and early spring, no-till soils are also generally wetter and colder than conventionally tilled soils. So in his next study, Gesch worked with ARS soil scientist and research leader Brenton Sharratt to evaluate the effects of seed coats in conventional-till and no-till fields. Sharratt works at the ARS Land Management and Water Conservation Research Unit in Pullman, Washington. The scientists compared the performance of coated and uncoated seeds of corn and soybean, planted in no-till and conventional-till fields in early spring and in late spring. Unlike corn seeds, soybean seeds do not germinate well until soil temperatures reach about 55°F. The scientists didn’t find any consistent differences in germination and emergence between coated seeds planted in conventional-till systems and those planted in no-till systems. As in the previous study, these results suggested that farmers could accelerate their production schedules by planting coated seeds in no-till fields in the early spring. But Gesch and Sharratt also found that coated soybean seeds planted in late spring were less successful because they were exposed to soil temperatures that were too high for successful germination and establishment. In a followup 2-year study of no-till production, Gesch, Archer, and soil scientist Kurt Spokas monitored the responses of coated and uncoated soybean seeds in no-till fields planted in early spring and late spring. Spokas works at the ARS Soil and Water Management Unit in St. Paul, Minnesota. As in the other studies, coated seeds emerged later than uncoated seeds. The coated seeds planted in early spring took longer to reach 90 percent emergence than seeds that were planted in late spring. But in both years of the study, planting coated seeds 4 to 5 weeks earlier than usual did not have any negative effects on eventual emergence or plant population establishment. However, planting coated seeds in late spring—after soil temperatures had risen and moisture levels had declined—did result in slower emergence and slower stand establishment. These studies were published in Agronomy Journal, Journal of Agricultural and Applied Economics, and Field Crops Research. “Not many farmers are using seed coats as a management tool yet, because the coating technology is not widely available,” says Gesch. “But the farmers we’ve talked with are interested in our findings, because they realize that using seed coats could help them optimize their planting schedules.”—By Ann Perry, Agricultural Research Service Information Staff. Russ Gesch is in the USDA-ARS Soil Management Research Unit, 803 Iowa Ave., Morris, MN 56267; (320) 589-3411 ext. 132. "Coats Protect Seeds Planted in Cold, Wet Soils" was published in the March 2014 issue of Agricultural Research magazine.